Scott Siedman, Only Human, 2010. Oil on canvas. This article originally appeared on April 21, 2011 in The Island. Michele Ellson, editor. Timed to coincide with the 33rd annual Saint Stupid’s Day Parade in San Francisco on April 1, “an extension of the medieval European tradition of the Feast of Fools, a public social satire on the powers that be,” Rhythmix Cultural Works’ K Gallery presents St. Stupid’s Art Show, guest-curated by Ed Holmes, aka Bishop Joey of the First Church of the Last Laugh, the parade’s founder. Paul Mavrides, Untitled (Ernie Bushmiller’s Nancy with a Single Eye), 2011. Ink on archival paper. Including the likes of Harry S. (“Dr. Hal”) Robins, Philo Drummond, Puzzling Evidence, and Paul Mavrides — all founders of the Church of the SubGenius — St. Stupid’s Art Show boasts serious counterculture star power, and K Gallery continues to expand the credibility of Alameda’s art scene. The Church of the SubGenius is widely considered a “parody religion,” not “anti-God” but condemning through satire the perceived commercialization of spirituality by organized religion. Defenders of Andres Serrano make similar arguments in support of his controversial photo “Piss Christ,” an image of a plastic crucifix ostensibly submerged in the artist’s urine. This week “Piss Christ” was vandalized beyond repair at a museum in Avignon, France. Its destruction underscores the power of artistic images and makes the exhibit at K Gallery that much more timely. 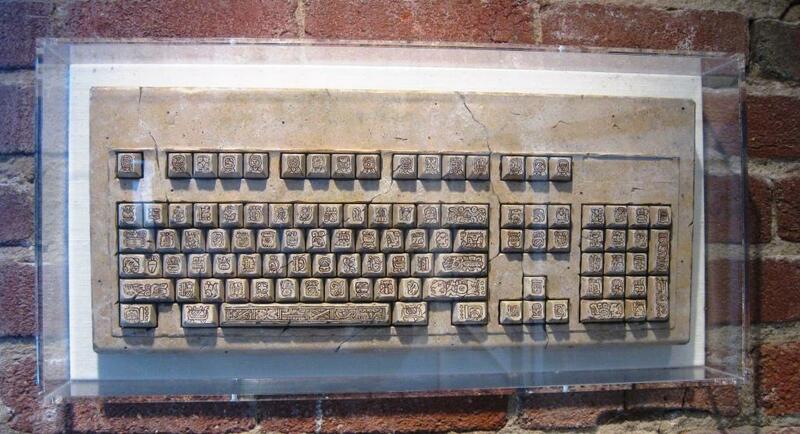 Jim Erickson, Mayan Keyboard. Acrylic paint on carved plastic. Photo by Michael Singman-Aste. If you meet St. Stupid in the road, break the mirror. Whether humans evolved or were created, we are far from perfect. 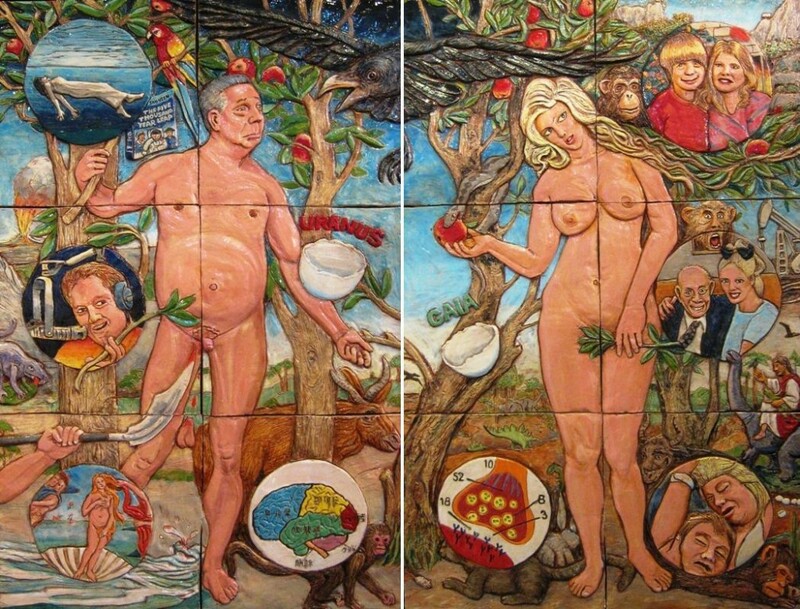 Jos Sances takes a swipe at Creationism in his three-foot high, sculpted ceramic tile diptych of Adam and Eve. Elements include the cover of “The Five Thousand Year Leap” by conservative writer Cleon Skousen which argues, among other things, that “without religion the government of a free people cannot be maintained,” portraits of conservative pundit Glenn Beck and the late Anna Nicole Smith with her octogenarian husband, and a robed figure riding a dinosaur. Jos Sances, “Adam” and “Eve” diptych. Sculpted ceramic tiles. Photo by Michael Singman-Aste. Paul Mavrides, a Church of the SubGenius founder and well-known cartoonist, contributes his take on the eponymous Nancy from the comic strip by Ernie Bushmiller. 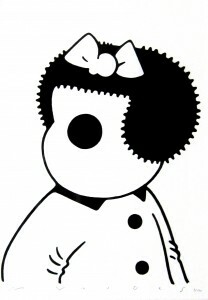 “Zippy the Pinhead” cartoonist Bill Griffith wrote that in Bushmiller’s reality, “The world as we know it has been reduced to its essentials.” Mavrides takes this a step further, presenting Nancy with her face featureless except for one large eye. Mavrides had also created another image of a three-fisted Nancy with five feet and multiple sets of triple eyes floating off to the horizon in which she laments, “There’s nothing left to be modernized.” Along with this cyclopean Nancy it pokes fun at how thoroughly modern we take ourselves to be, while showing the folly of change for the sake of change, of fixing what isn’t broken. Sometimes obscuring the message in ambiguity is the ideal method for transmission, a form of artistic steganography. Other times subtlety must be abandoned, the would-be recipients beaten over the head, to make sure they get it. d’Arci Bruno, Love American Style. Acrylic on canvas. There’s nothing subtle about “Love American Style,” the acrylic painting by K Gallery Director d’Arci Bruno; It’s all shock and awe. Eyes pop cartoon-style from the sockets of a skull at the allure of oil (ah-OO-gah! ), phallic missiles seek their targets, and the bone-littered battlefield is already staked out as a future site for Walmart, Home Depot, and Target. 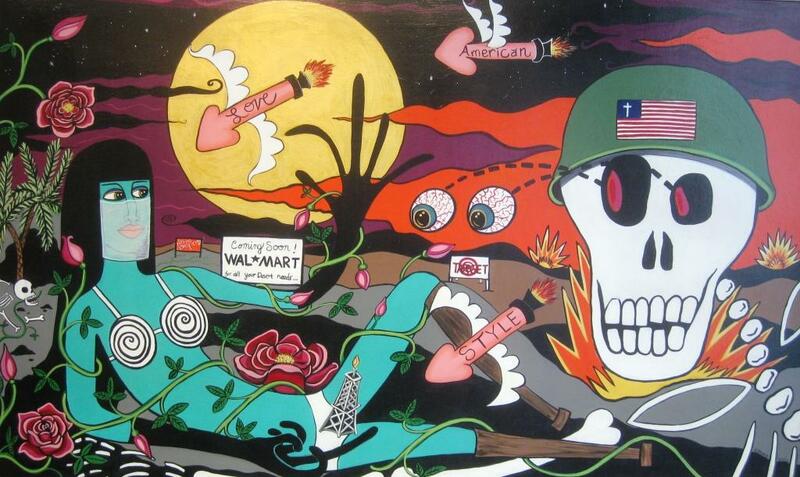 Factor in the skull’s helmet with its crucifix flag insignia and Bruno has neatly captured the military-industrial complex, war for oil, and killing in the name of religion on one canvas. 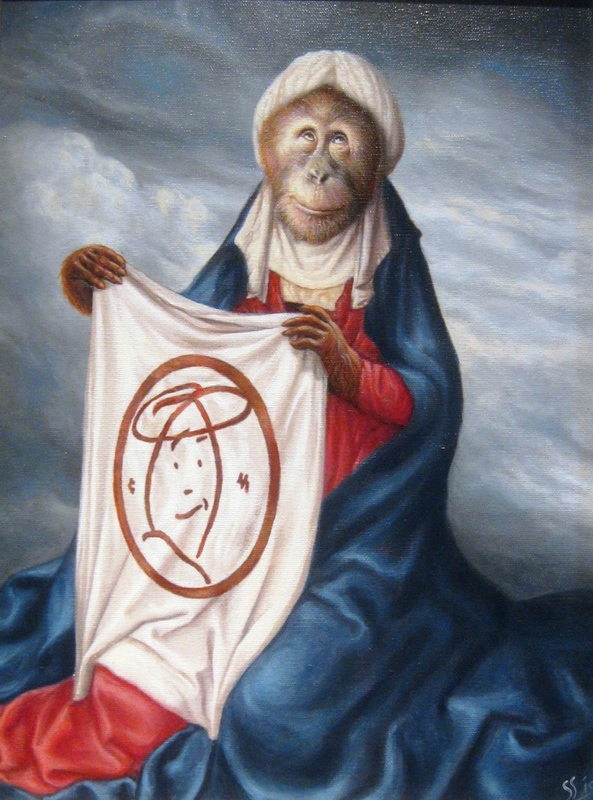 Nothing is sacred, or at least off-limits in “Saint Stupid’s Art Show,” so come with an open mind. The exhibit also includes work by Blake Moore, Spy Emerson, Jim Hair, Art Hazelwood, William Binzen, Ann Ominous, John Wehrle, Marc Ribaud, Pons Maar, Al Honig, Freddy Hahne (aka AreWeReally? ), Julian Kenji Carreiro, and Janet Koike. St. Stupid’s Art Show runs through April 30. Rhythmix Cultural Works is located at 2513 Blanding Avenue, Alameda, CA 94501. The gallery is open 6 p.m. to 9 p.m. Wednesdays and second Fridays, or call 865-5060 to schedule an appointment.